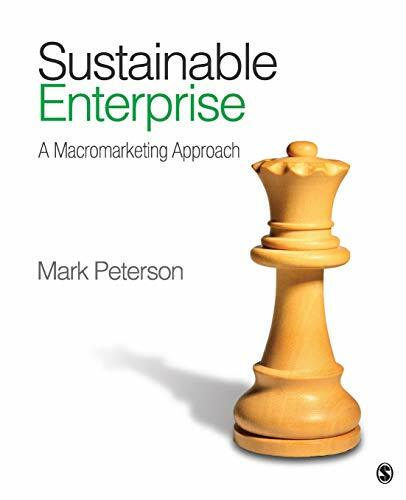 Sustainable Enterprise goes beyond the internal firm strategies of micromarketing and the "four Ps" to take a broader perspective focused on the interconnectedness of markets, marketing, and society. In an increasingly globalized society concerned with social and environmental sustainability, this book encourages students to think critically about the opportunities and limitations of marketing, as well as its positive and potentially negative effects. Through the presentation of key research findings and actual company cases, Peterson engages students with questions such as, Are global firms involving themselves too much or too little in global markets? Is consumer sovereignty sustainable? Is the greening of the marketplace being done too slowly or too fast? How do poor consumers in developing nations perceive marketing institutions? Based on the premise that firms using holistic marketing strategies are better able to assess risks and identify opportunities, this text also then explains how to create compelling marketing plans designed to benefit the company, key stakeholders, and society at large. Sample marketing plans and strategies for developing holistic marketing plans provide students with guidance on how to put theory into practice. Dr. Peterson received his Ph.D. in marketing from Georgia Tech in 1994 and joined the University of Wyoming faculty in Fall 2007 where he teaches doctoral, MBA, and undergraduate students. He previously taught at the University of Texas at Arlington. His research interests include marketing and society issues, research methods, as well as international marketing. He is an associate editor for the Journal of Macromarketing, and has served as Secretary/Treasurer of the Macromarketing Society. He currently serves on the board of directors for the Macromarketing Society, and the International Society for Quality of Life Studies (ISQOLS). His research has been published in such outlets as Journal of Macromarketing, Journal of Academy of Marketing Science, Journal of Public Policy & Marketing, Journal of Advertising, Journal of Advertising Research, Entrepreneurship Theory & Practice, Journal of International Marketing, Journal of Business Research. Dr. Peterson was a Fulbright Scholar at Bilkent University in Ankara, Turkey in 2006.